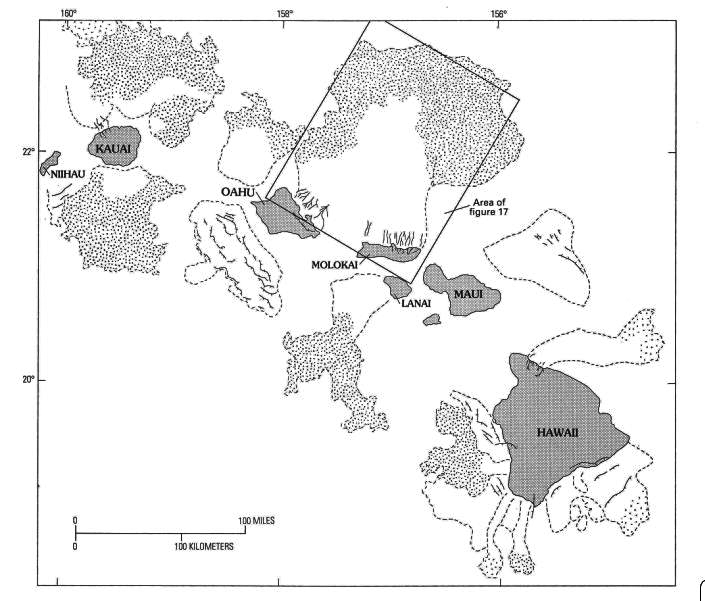 USGS diagram from “Imaging the Sea Floor,” showing the extent of landslides around the Hawaiian Islands. 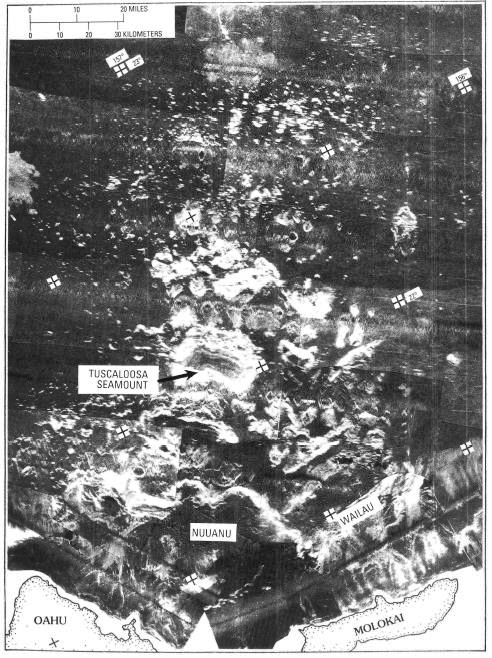 The actual image, from the same article, produced by the side-scan sonar of the large landslide in the box is shown below. Not only did the side-scan sonar find evidence of landslides about the Hawaiian islands, but their runout distances in the hundreds of miles in some cases, and also the shapes of the islands themselves, indicated that this was a commonly occurring, and in many cases, a catastrophically impacting event in the life of a marine volcano. I’ve already described the basic processes which drive the landslides on these volcanoes in the previous article. Geologists have also been gathering evidence on the forms these landslides take, and break them down into two types: gradual slumping of blocks of material from the sides of the volcano in which large blocks of material stay relatively intact, and catastrophic debris avalanches which break material up into smaller, chaotically jumbled and scattered remnants. It is the second of these types of landslides which are feared to have formed giant tsunamis that can wash up, and in some cases, over some of the islands. There is some evidence of these having happened in the past where large chunks of coral have been deposited hundreds of feet above sea level. One of the articles I read in preparing this piece was written in the mid 2000’s (see “Slope failure and volcanic spreading along the submarine south flank of Kilauea volcano, Hawaii,” below) in which the authors researched the composition of the south flank of the Kilauea volcano and what the likelihood of a catastrophic failure would be on the south flank. Luckily, the researchers have found evidence that such a failure did occur in the geologically recent past (10-50k years), but the material that fell formed a shelf that is buttressing the volcano against future catastrophic failures, unless the volcano should become very large. We visitors to Hawaii can rest a little easier knowing that, and also we can visit the Great Crack in the Kau Desert area with some assurance that the island flank is not in imminent danger of cracking and falling away from there. The Great Crack as seen from the air. From NASA’s virtually Hawaii project. The crack is 6 miles long and is a surface expression of the currently quiescent Southwest Rift Zone of Kilauea. It’s easy to spot on Google Maps and if one follows the line it makes, one can see that there is a series of cracks terminating in the Kilauea summit caldera (although the Great Crack is a segment of the cracking further downrift of the section that runs into the caldera). The crack is really impressive in size, 60 feet wide and 60 feet deep in places, with lava tubes cutting through it and other such features. The NPS has recently acquired the land on which it sits, so they will hopefully develop trails to it for Hawaii adventurers.